Like playing Donkey Kong in a game of Mario Kart, video game villain Ralph (John C. Reilly) became a good guy at the end of Wreck-It Ralph, and a hero to erratic Sugar Rush racer Vanellope von Schweetz (Sarah Silverman). His "hero journey" complete, there never really seemed to be a reason to revisit Ralph, except to put his newfound friendship and sense of self to the test. And no place can ruin relationships and crush one's self-confidence better than the Internet, which is where Ralph Breaks the Internet takes us. Although the title might be more appropriately titled, The Internet Breaks Ralph. The rare big-screen Disney Animation sequel (I'm not talking those straight-to-video sequels or anything Pixar), Ralph Breaks the Internet explores the friendship between Ralph and Vanellope, which has been going strong for six years. While Ralph is happy with his daily routine, it's Vanellope who has grown bored of the racing the same old tracks and knowing how everything will turn out. When Ralph's clumsy, ham-fisted attempts to cheer her up end with Sugar Rush getting a broken steering wheel, and kindly old Mr. Litvak threatening to unplug the arcade game for good, they venture off into the Internet to try and save it, literally by buying a replacement on eBay, or "E-Boy" as Ralph calls it. For me, Wreck-It Ralph was nearly a perfect movie. It spoke to the '80s video game nerd in me, and all of the callbacks to the game characters of yesteryear were brilliant. That it managed to be nostalgic while telling an emotional, frequently hilarious story about Ralph's evolution was just one of its many accomplishments. So the idea of going into the Internet for a sequel was considerably less appealing. Do we need another critique of the dangers of social media? Or another anti-bullying movie? Turns out, when it's Ralph Breaks the Internet, yeah we definitely do need another one. Co-directors Rich Moore and Phil Johnston have told a beautiful, funny, heartwarming story that embraces and skewers everything we know about the web. At the same time, it's also a surprisingly tender story about friendship, and whether it can withstand the vast opportunities afforded by going online. If only the Internet looked the way Moore and Johnston envision it. The co-directors go absolutely nuts in visualizing the online realm, which resembles the avatar-based worlds of Ready Player One and Summer Wars. Mostly gone are the Q-Bert and Sonic references (the Street Fighter dudes still crack me up), replaced by jabs at Google (which looks like a giant monolith), Twitter (a tree surrounded by tweeting birds), Friendster, and the Dark Web which looks like a crime-filled back alley. Like the first movie, sight gags are where you'll find the biggest laughs, and there are so many it would be impossible to catch them all. Suffice it to say, the more of a techie you are the more gags you'll catch, and it makes me wonder if the humor is better suited to adults than kids. They'll be floored by the sheer volume of things happening on the screen at once, but doubtful a kid is going to get why an Internet joke about Al Gore ("Are you the Algorithm?") is supposed to be funny. Of the many online landscapes to be explored, the most visceral is in the Grand Theft Auto/Twisted Metal-type game called Slaughter Race, where Vanellope makes a new friend in Shank (Gal Gadot). Shank's free-wheeling, edgy and unpredictable lifestyle is exactly what Vanellope wants for herself, but of course, Ralph wants to keep his friend around for himself. His entire persona, the hero he sees in himself, is dependent on Vanellope keeping him around, and he goes to rather extraordinary lengths to make sure nothing changes. Ralph's insecurity only grows as Vanellope becomes more independent, while she seems right at home. Vanellope takes more of a central role here, and she's right smack in the middle of the scene everyone has been talking about. Yes, the one with all of Disney's princesses, voiced by the original actresses (!!!) and gathered together like they're living on sorority row. It's by far the greatest highlight and a brilliant example of Disney poking fun at itself and celebrating the incredible legacy of female characters. 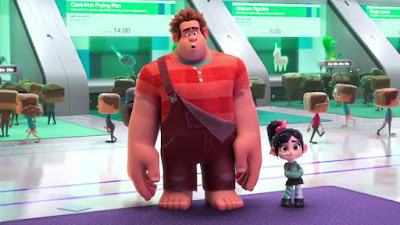 Whoever thought to bring all of them together, in a Wreck-It Ralph sequel no less, deserves a pay raise. Don't think for a second it'll be the last we see of them together, either. I smell franchise. For a giant corporate entity with a substantial digital footprint, it should be no surprise Disney paints a rosier-than-reality view of the online experience. Ralph and Vanellope have a mostly joyful experience, even when faced with Pop-Up ads and a major instability that threatens to destroy everything. However, the movie does break from their adventures for a brief bit of messaging when Ralph, who has suddenly become a viral superstar, dares to check out the stinky bathroom that is the comments section and is shocked (SHOCKED I tell you!) to discover everyone on the Internet isn't so nice. It's a well-meaning moment but it either needed to be longer, because it lasts for maybe a minute, or simply not be there at all. I found it distracting and on-the-nose when everything else has the spark of cleverness. Having conquered the 8-bit days and the modern social media craze, it's unclear where Ralph will show up next. Maybe he'll get trapped inside an MMORPG? Or go fully analog inside a board game? Let's hope it's not that last one. With the help of Reilly and Silverman's performances, Ralph Breaks the Internet brings more compassion than you're likely to see the next ten times you go online.